I am honored to have JL Knopp of The Disney Driven Life as our Monday Mentor today. You are all familiar with her website, it's so full of great Disney information. But I have to tell you she is one of the sweetest people. Thanks for sharing your wisdom JL, I am thrilled to have you here!! 1. Introduce yourself and describe your blog. My name is JL Knopp, and I was born and raised in South Florida. Being so close to Walt Disney World, I grew up regularly visiting the Mouse and developed a fascination with the creativity of Disney Parks. Noticing that my happiest moments seemed to always take place in Walt Disney World, I began trying to recreate the magic of Disney in my everyday life beginning in my pre-teen years. Adulthood, thirteen years of marriage and three children later, I continue to lead a Disney Driven Life and diligently work to pass my love for Disney on to my husband and children. This lifestyle was the inspiration for the eventual vision of my blog, thedisneydrivenlife.com and the Neurotic Disney People community that surrounds it. Through this venue I strive to help other Disney fans stay connected to the brand that has served as a keystone in my family life. Originally I wrote a Disney trip report that I titled “True Confessions of a Neurotic Disney Mom” and posted it on some of the boards of which I was a member. Many people seemed to really enjoy reading the stories that I told about my family’s adventures in Walt Disney World, and I was encouraged to keep writing beyond the trip report. This, along with a growing number of people who wanted to be associated with the principles for vacationing that I discussed in my trip report, prompted me to set up a blog. 3. What do you think is the best way to attract new readers/followers? I think that the best way to attract new readers is by being yourself and being personal. People take interest in you when they can relate to you. So when you write, allow your personality to be expressed through your words in order to make a connection. Let your work reflect that you are a human rather than a just a report. On the flip side, people also take interest when you take interest in them. Social media platforms like Twitter and Facebook now give us the chance to actually interact with our audience. We have the opportunity to show that we don’t only care about them listening to us, but that we care about listening to them. So when you tweet, engage your followers on a personal level, asking them about things that are happening in their lives. Being other-centered rather than self-centered is always an attractive thing. 4. What is the best/worst advice you have ever received? The best advice I ever received was to ignore the “peckers.” It seems that there are some people that will do what they can to drag you down, especially when you are headed in the right direction. Their motives are varied, but usually the appropriate response is the same. Do not acknowledge their hurtful actions. Stay focused on your goal and walk towards it with dignity. The worst advice I ever received was to keep the focus of my blog on me. 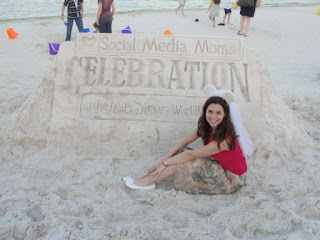 My blog did started off being solely about me and my family but transitioned into being about a community with a shared habit of bringing Disney into their homes. The evolution of this has put a lot of “cooks in the kitchen,” and sometimes created difficult situations that have had to be worked through. However, I won’t ever try to take center stage on my blog again. I feel the impact that the blog has had on people’s lives has been far greater and more powerful because of the community aspect of The Disney Driven Life. 5. What is the biggest mistake most bloggers make? I know the biggest mistake that I made was not having a plan in place before jumping in. I wish that I had sat down, made goals, set deadlines and thoroughly developed a vision first. Instead, I “just did it” and figured I’d make it up as I went along. Because of that I was not ready when the blog got some momentum, and I have always struggled to keep up with the growth of the blog. 6. How important is social networking to blogging? In my opinion, social networking is EVERYTHING to blogging. When I watch the analytics of my blog, it is obvious that it directly correlates with my social networking activities. During phases when I am active, the traffic on the blog greatly increases. During phases when a personal break from being “plugged in,” the traffic on the blog begins to decline. 7. How important are labels, and do you have any advice on choosing labels for posts? I am far from an SEO expert, so I don’t have any great secrets to share concerning this other than to “tag” your posts. I have no secret words or formula for getting a leg up in doing so, but if you don’t “tag” your posts, you are sure to never get that leg up. 8. What is your favorite Disney resort? I haven’t stayed in all of the Disney resorts yet, so I don’t know that I’m entirely fair in my pick; however, Disney’s Animal Kingdom Lodge is certainly the personal favorite of my entire family so far. The ability to see such exotic animals right off of your balcony combined with the very unique theming and incredible restaurants is something that really appeals to my family. 9. Do you have a Disney Vacation tip you would like to share with our readers? Come prepared and with a plan. A Disney vacation can be very overwhelming to people who just show up and expect to “experience magic.” Magic can certainly be experienced at Disney by even the poorest of planners because Disney property seems to be saturated with it, but the magic will be enhanced exponentially if there is a strategy for covering the activities that your family designates as most important. My personal favorites for finding guidance in this area are the book, The Unofficial Guide to Walt Disney World, and the site TouringPlans.com. Great interview! Thanks so much for sharing your advice and your love of Disney! More great advice! It seems to me that NO ONE has a more genuine writing style than JL. Another wonderful MM w/ DisneyDonnaKay! And another perfectly executed article by J.L! Well, I commented yesterday but I don't see it today. Gotta love Blogger. Thanks everyone for your comments, I was thrilled when JL said she would contribute to Mentoring Mondays. I have been very fortunate to host such wonderful people on my blog, and to have such great friends who stop by every week. THANKS!!! Great interview. I've had the pleasure of working with JL and she's amazing. Lynn, I agree 100% she is amazing and a very sweet lady! !